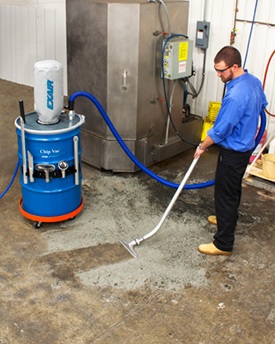 EXAIR’s new Premium Chip Vac™ System comes complete with a 30, 55 or 110 gallon drum, ready to use for your specific application. The Chip Vac is used to clean chips or other dry materials from fixtures, floors and work surfaces of machining centers, lathes, saws, mills and other industrial equipment. It can easily be moved from drum to drum to keep different materials separate for recycling. The Premium Chip Vac System comes complete with a 30, 55 or 110 gallon drum, Chip Vac, lever lock drum lid, shutoff valve, filter bag, 10′ (3m) flexible vacuum hose (1-1/2″/3/8mm I.D. ), heavy duty aluminum tools, 20′ (6.1m) air hose, drum dolly, tool holder and quick connects fittings. Prices start at $1325.50.